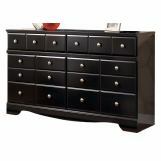 The "Shay" bedroom collection brings together a rich dark finish with the sophisticated detailing to create furniture that is sure to awaken the decor of any bedroom with stylish contemporary flair. 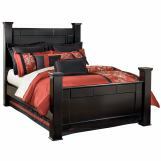 The contemporary black finish features a rich merlot undercoat which flows beautifully over the swooping shaped base rails and the straight-lined design with wide segmented details framing the bed and mirror. Adorned perfectly with the complementing satin nickel colored hardware, this bedroom collection fits flawlessly into any home decor. Create the bedroom of your dreams with the exciting contemporary style of the "Shay" bedroom collection. Love the look. Seems like a durable sturdy bed. Can't wait! where can i find out what size the draws are? 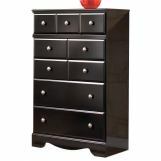 The drawers are extremely small, especially in the chest. 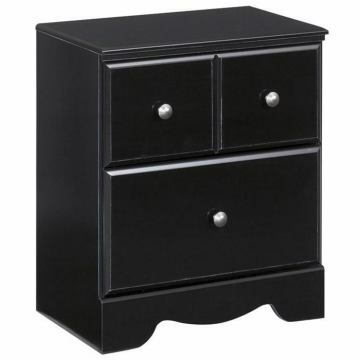 The night drawers are deeper than both the chest and dresser. Definitely not enough storage! You can always call the vendor Ashley. Is the under bed storage a pair or just one side so I know if I order one or two to get both sides? Best Answer: You need to order 2 one for each side. I ordered this back mid may and I am still waiting for the bed, they keep saying Ashley has it on back order yet the site has it in stock. The underbed storage is just 1, if you want it on both sides then you would have to order 2 of them. Is this bed available in a full? Best Answer: It only comes in Queen and King size bed. how to put it together? 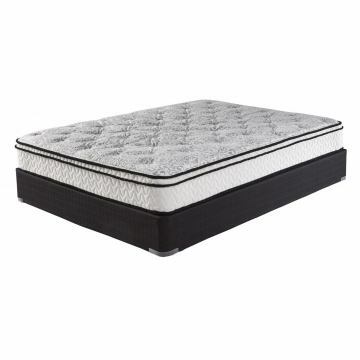 Can you have a Movable base with this bed? Best Answer: This is only available with a stationary base. I was wondering if you have this item that instead of the mirror and dresser I could replace it with 2 chests instead of the dresser and mirror? And if so what the price would be? Is this bedroom sturdy? Is it worth it to spend more for a real wood set? 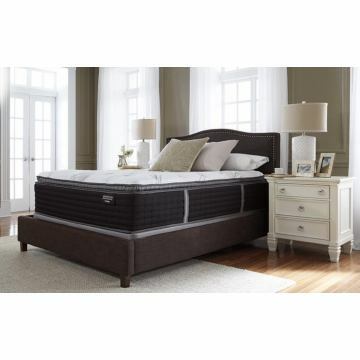 I have seen some questionable reviews about the bed's support and Ashley Furniture in general. Best Answer: Hello, yes the bed is sturdy and made of engineered wood. We also offer solid wood bedroom sets under the name Kincaid. Is this made of real wood? 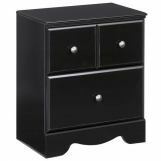 Best Answer: Hi Jamela, Thank you for your interest in the Ashley Furniture Shay series in black. 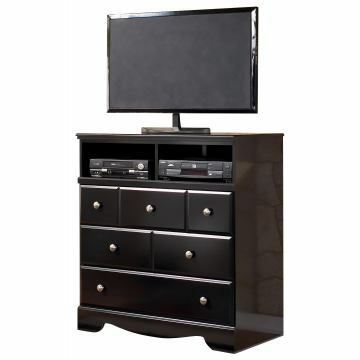 Like all items in the Ashley Furniture Industries product line, the base construction is an engineered wood product that is used for superior strength and durability over plywood or chipboard. It is utilized so a complete tree can be used in the manufacturing process instead of just a small portion of the tree, therefore making this product extremely green friendly toward our environment. The actual engineered board has a density rating that is much higher than any normal "solid wood" product. Due to the detail and finish of the Shay series, a "solid wood" product would not be possible or advantageous in any way. Thank you for your inquiry and sorry about the long response. Is this set made of hardwood or rubber wood? 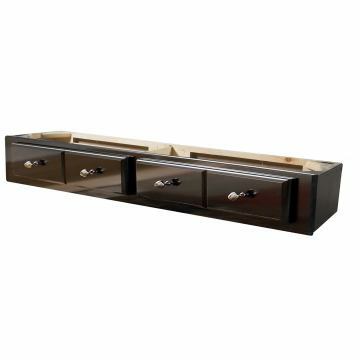 Best Answer: Hi Scott, this set is made from MDF (medium density fiberboard). dose it come in cal king? Best Answer: Hi, this particular set does not come in cal king but we have many others with similar styles that do. One of our furniture specialists would be happy to help you find the perfect one for you. Call us at 866-730-7837 x 1. 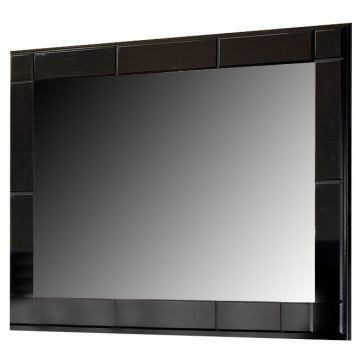 This Shay Collection item features a video.